Normally when I’m taking a short ride in the car with my family, I never take along a book. It would be rude to read when everyone wants conversation and attention. Yesterday, however, while driving to our church, on a Sunday, with my family, I greedily carried along The Alloy of Law. I was at the end of the book, and the ending was that good. How often have you read about a gunfight between the good guys and the bad guys where they use magic to to push the bullets harder, create speed bubbles to escape flying bullets, soar into the air while pushing off metal and other unimaginable tricks to win? I’ve never read a book like that, and that’s what makes The Alloy of Law so good. It’s new and it’s different. A departure from the typical fantasy, but with a familiar setting and an intriguing magic system. The story is about a former lawman, Waxillium, who returns to his home in the city after twenty years in the Roughs. He quickly becomes involved in a robbery/kidnapping operation. With the help of his former partner, Wayne (Yes, we have Wax and Wayne as the main characters!) and a University student studying law, Marasi, the three of them try to get the bad guys and stay alive at the same time. I really liked how this book was tied to the Mistborn world, with lots of references and connections to the original story. I was wishing I had read Mistborn more recently, so I could remember more details, but this is a good opportunity to re-read it. I liked the characters Wax and Wayne, they have a fun repartee. Wayne was really interesting with the way he could impersonate people by ‘collecting’ their accents. Marasi however, I didn’t find as believable. Something was missing, I felt that I didn’t really understand who she was and what her purposes were (sorry Brandon!). But the story is excellent, the solutions imaginative and the ending, as mentioned above, is a page-turner. Don’t we love our decorative shrubs? And thank you Brandon for not having him land in the ‘bushes’! Read this book! It’s great! 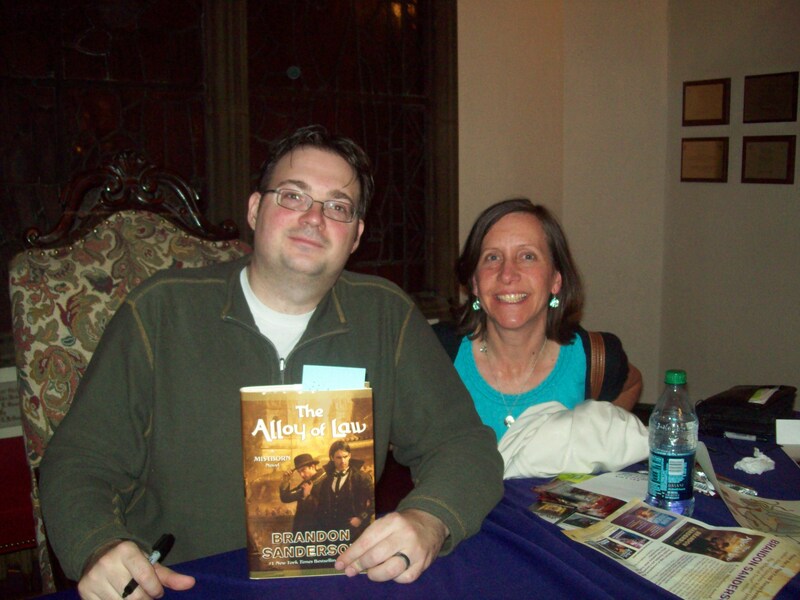 To find out more about The Alloy of Law and all his other works, check out Brandon Sanderson’s website. Brandon Sanderson book signing....and me! Previous Previous post: Why Won’t a Man Tip a Woman to Tie Down a Tree?